Puerto Rico weather brings an interesting dichotomy in weather. It mixes plenty of sun, with a bit of rain, for cooler than average Caribbean islands temperatures. The current weather in Puerto Rico is below. This Caribbean island has the trade winds from the northeast blowing in its direction, which causes heavy rains at times. This coupled with Cordilla Central Mountains makes it one of the cooler Caribbean islands on average. The year round temperature averages is an extremely comfortable 76°F (24°C) (which is about the temperature I keep it in my car and house), with the only major difference being in the upper elevations where the temperature gets as low as 66°F (19°C). 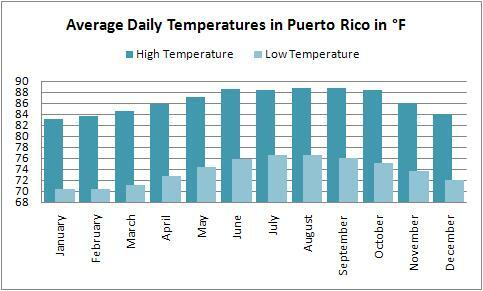 The near constant temperature in Puerto Rico Weather makes visiting the island a pleasant experience all year around. The northern coast (where San Juan is located) is warmer than the southern coast, and temperatures here can get as warm as 80°F (27°C) on average in August. The temperatures on the north coast abate just a bit in February, falling to and average of around 75°F (23.9°C). The inland temperatures often see a 10 to 15°F drop in temperature as you move further inland and to higher elevations in the Cordilla Central Mountain Range. Can I Expect a Lot of Rain in the Weather in Puerto Rico? Because of the trade winds from the northeast and the mountainous terrain on the island, the northeastern shore is wettest section of the island. Rainy season lasts from May to November, where the monthly precipitation ranges from 4 to 6.5 inches on average in the capital city of San Juan. The rain on northern part of the island is mostly caused by the conduit effect of the Cordilla Central Mountains. When the warm winds run into the mountains, their speed increases and they are forced upward. As the air cools down in the higher altitudes, it condenses and you get rain in the Puerto Rico weather as a result. The mountains serve to largely shelter the southern part of the island. It is important to know that when we talk about rain, we are generally talking about your typical Caribbean "clear up shower." By "clear up shower", I mean, a quick, hard rain where the water goes "clear up" to your kneecaps, then the sun returns to save the day. Weather in Puerto Rico is rarely affected by tropical storms and hurricanes. It is only brushed or receives a direct hit from a storm system only once every 3.89 years (only 35 times in 136 years through 2006). They go an average of 17 years between direct hits, making Puerto Rico a fairly safe bet for your next vacation. Todo esta bien with the weather in Puerto Rico!